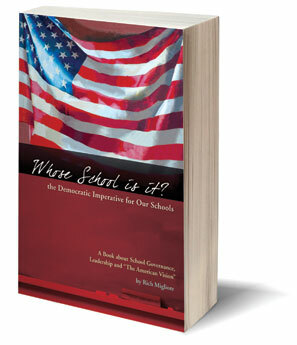 Welcome to Democracy in Education -- the website dedicated to the creation of the "Great American School" for all of our children through the practice of democracy and its collaborative ideals. The Democratic Imperative for our Schools. A must for policymakers, board members, educators, administrators, teachers, parents and students. Migliore raises the issues, the law, the research— the facts about school governance and leadership. How we can create the “Great American School” for all of our children and ensure “the best interests of the students” is truly the guiding principle for our collective endeavor. Click here to order online on Amazon.com. Please contact us for bulk ordering information. The mission of Democracy in Education is to promote the ideals of American democracy and its practices in the governance of our schools so that we can set the conditions for great schools to emerge for all of our children. © 2008 Integrity Press. All rights reserved.